The upgrades of High Energy Physics (HEP) experiments at the Large Hadron Collider (LHC) will call for new radiation hard technologies to be applied in the next generations of tracking devices that will be required to withstand extremely high radiation doses. In this sense, one of the most promising approaches to silicon detectors, is the so called 3D technology. This technology realizes columnar electrodes penetrating vertically into the silicon bulk thus decoupling the active volume from the inter-electrode distance. 3D detectors were first proposed by S. Parker and collaborators in the mid ’90s as a new sensor geometry intended to mitigate the effects of radiation damage in silicon. 3D sensors are currently attracting growing interest in the field of High Energy Physics, despite their more complex and expensive fabrication, because of the much lower operating voltages and enhanced radiation hardness. 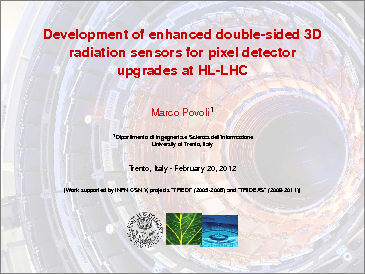 3D technology was also investigated in other laboratories, with the intent of reducing the fabrication complexity and aiming at medium volume sensor production in view of the first upgrades of the LHC experiments. 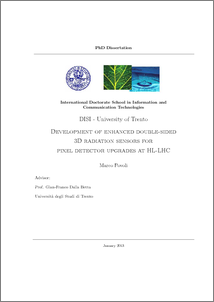 This work will describe all the efforts in design, fabrication and characterization of 3D detectors produced at FBK for the ATLAS Insertable B-Layer, in the framework of the ATLAS 3D sensor collaboration. In addition, the design and preliminary characterization of a new batch of 3D sensor will also be described together with new applications of 3D technology.